There's a reason Resident Evil 4 is such a standout in the series. It shed years of traditional features—tank controls, static camera angles, and awkward pacing—and replaced them with shooting mechanics that redefined the action-horror genre. The Resident Evils that came before it are still classics, especially Resident Evil 2, but it'd be so much more fun to play if Leon Kennedy had some of his Resident Evil 4 moves. One fan created a short demo of what that would look like, and it's as good as you'd suspect. 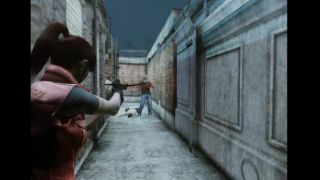 The assets you see were extracted from on-rails Wii shooter Resident Evil Darkside Chronicles, and the gameplay was programmed on UDK. It doesn't sound like Lima has any plans to keep working on this, but now that we've seen the potential, we want it. Modding community, Capcom, please don't leave us hanging like this. Resident Evil 4 HD was recently released on Steam, and our review found that it was still great after all these years. But don't take our word for it. Let these reload animation GIFs speak for themselves.